In 2010 Mahima Dewan Pillay was diagnosed with sarcoma (bone) cancer. But the support, motivation, love and care that she received from her parents made her fight against the disease much easier. She went for her treatment in New Zealand and returned to continue her life as usual. Unfortunately, after seven years Mahima is again suffering from the same disease. She suffered a relapse last year and her family needs close to $18,000 for her treatment in Australia. 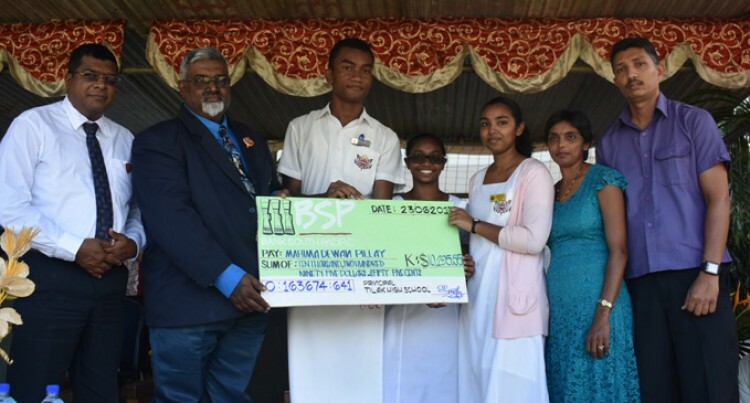 But with the support of Tilak High School, where she is a Year 13 student, the management handed over $10,000 to her family at the auspicious Tilak Day celebrations. To honour her further and show their support to raise awareness in the fight against cancer, five male teachers shaved their hair in front of the teachers, students and guests. Mahima said: “Cancer is one of the biggest health challenges a person can face. Mahima thanked the management for their generous donation which would enable her to get treatment. Her mother, Sumintra Devi said: “I was really scared of losing my daughter when I got to know that she was suffering from cancer at first. “Now I am brave and I will always motivate my daughter and tell her to be faithful that she will be cured. “In 2010 my daughter was only in Year Seven and when she came to know that she was suffering from cancer, she was disheartened that she will be no more in this world,” she said. She thanked the school for their support. “Also special thanks to those five teachers who shaved their heads to create awareness on cancer,” she said. One of the five teachers whose head was shaved yesterday is Language and Social Science teacher Navneel Ramlu. “I feel proud that I was part of this good cause,” he said.